There is an important distinction to be made between “felt” and “enacted” stigma. Felt stigma arises from the real or imagined stigmatizing responses of others. It has an important role to play in “policing” the behaviour of people living with HIV/AIDS, causing some to deny their serostatus, others to conceal it, and all to experience anxiety about telling others and seeking care. The consequences of both felt and enacted stigma undermine efforts to challenge HIV/AIDS-related discrimination, stigmatization and denial. 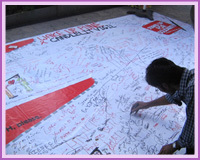 Both prevent people living with HIV/AIDS publicly acknowledging their serostatus and playing their full and proper role in prevention and care. Interventions targeting discrimination need to take place concurrent with the establishment of a supportive legal framework that includes generic antidiscrimination laws covering health care, employment, education, housing and social security, as well as effective enforcement mechanisms. Other important and complementary activities must include efforts to change attitudes through communication campaigns in the media, education and training. We believe that this battle against HIV will be won or lost at the grassroots — you are the grassroots. 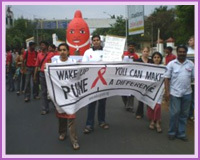 Following the success of the star-studded HIV awareness events at MG Road the Wake Up Pune campaign is asking people to take the lead and be ‘HIV POSITIVE’. What does this mean?